This simple question can feel like a supercharged jab at your psyche. 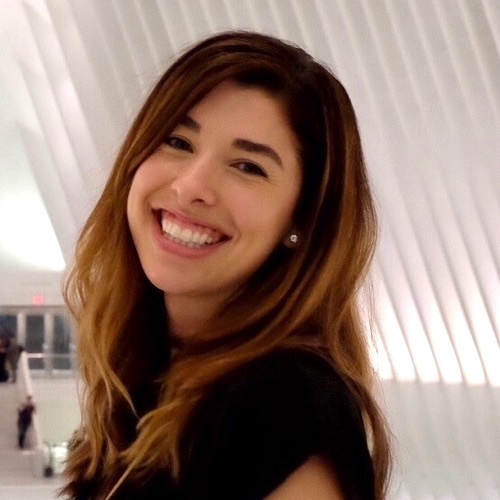 You’ve been coordinating schedules for meetings, making sure everyone signed a birthday card for the boss, and spent an unplanned hour fixing typos in a team report. You hit the end of the day exhausted, with no real outcome to show for all the energy you spent handling a million different things. As much as you may try to measure your productivity in to-do lists, hours worked, projects completed, and other quantifiable methods, there is a lot of work you do everyday that is invisible—and it can be equally as taxing and time-consuming as the stuff you write down in your planner. That invisible work is called the mental load, and when it’s left hidden underneath your “official” work, it makes you far less productive. When you and your team don’t talk about the toll it takes on your group dynamic, it actually makes all of you more stressed and less successful. If you and your team feel like you’re getting collectively held back from feeling creative, in-sync, and equally valued, then it’s time to turn the lights on this unseen task master and see just how heavily it’s weighing down your workload. The mental load is the total sum of responsibilities that you take on to manage “the remembering of things.” It has to do with emotional labor, defined by Arlie Hochschild in the 1983 book The Managed Heart: Commercialization of Human Feeling, as the process of managing emotions and relationships with others in order to be more successful at your job. In group settings, it’s an unrecognized responsibility of extra work some members will take on to keep the group running happily and healthily. Oh, and if it sounds familiar, that’s because it’s a core part of feminist discourse—emotional labor is overwhelmingly a responsibility placed on women. 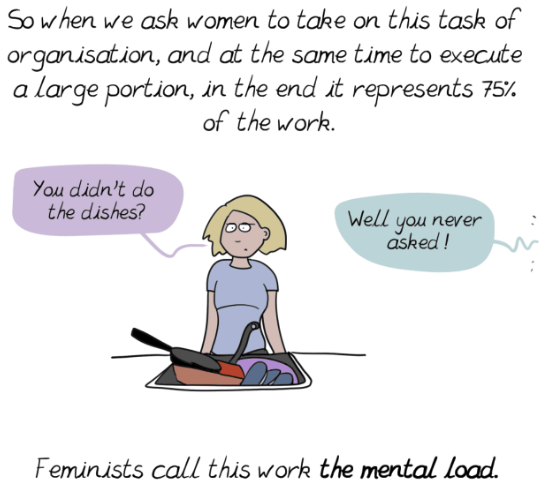 This popular comic, by an anonymous French author via the pseudonym “Emma,” can largely be attributed as having brought the concept of “the mental load” to the forefront of Western culture’s collective conscious as a problematic way in which many gender-conforming households are organized. 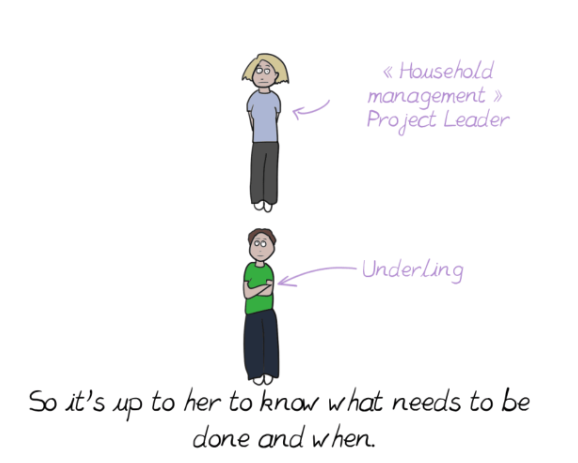 The comic points out that one partner (most often women) is generally designated as the manager of such “remembering work,” while the other (most often men) takes a more siloed approach to what needs doing. This work of remembering is always top of mind for the “manager” so in the end, it doesn’t actually relieve them of doing their share of the execution work. At home, mental work typically looks like this: Coordinating kids schedules, booking medical appointments, planning holiday meals, monitoring the levels of milk and laundry detergent, while making shopping lists for everything else that needs to be refilled. The result? The designated “manager” in such households end up taking on more work than their counterparts, because managing these items takes mental effort, as does actually getting them done. For example, the woman of the household is thinking about the chores that need to be done around the house, and asks her partner to empty the dishwasher. When she comes home, she sees that her request has been done, but a pile of dirty dishes still sit in the sink, unwashed. She decides to just clean them up instead of asking for help. Always being the first remote team member to break the ice and wish everyone “good morning” on team chat. 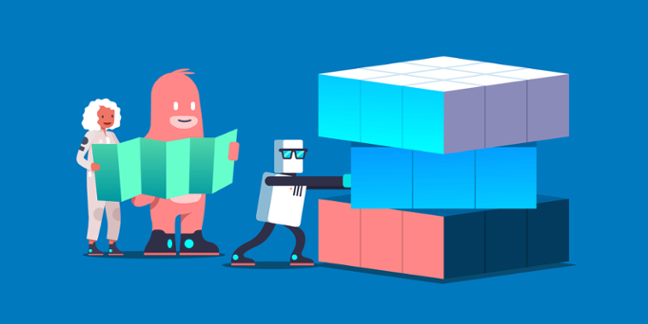 So if you find yourself taking on the bulk of organizational tasks for your team when they’re not a core part of your job function, you could be building up a mental load that blocks you from doing other things that are more valuable to you and your team. The habits we have at home to pass off the tasks we dislike (bathrooms and bills, anyone?) have a direct tie to the concept of social loafing in the workplace: People tend to take less initiative when working with a group than they would if they were solely charged with the responsibility. What do you see when you look at the sum of your team interactions and spaces at work as a household? Is there an equal distribution of effort for all those little team tasks that are needed to keep it running smoothly? Before you run off and start feuding with your team about their constant expectation that you’ll send the meeting invites, perhaps the first question to consider is: Why do you take on these workloads when they’re not technically your responsibility? You may have been socialized to feel a sense of duty and expectation that it’s your responsibility. This is particularly pertinent for people who have been raised as “caretakers” in many cultures. You do get joy and satisfaction from helping others. When you step forward and take initiative on organizational efforts, you feel the reward of helping to maintain a functional team. On the flip side, it’s common to fear incoming failure or blame should things not happen (or happen correctly), so you let that fear drive you to take on extra work that should be shared by others. There is probably a hierarchy in which your role fits at work, and your position within the team can set you up to accept or delegate tasks. Whatever the reason, there is a reasonable limit to the “extra” tasks you should be expected to perform. They should be guided by your job description and measured results for success in the role. But where do you begin? Exploring your underlying instincts to take on a mental load can be helpful in coming up with a better distribution of tasks across your team. You may be unaware of things other people on your team are taking on that relieve your need to take on that work. A word for the remote work fams: Long-distance relationships are hard. So imagine keeping up your work family’s household when you all live in different places. For remote teams, the load of invisible work can quickly become a serious issue because working relationships are managed across various cities and time zones. Team empathy and communication is even more important when you can’t simply walk by your coworkers desk and see what they’re working on. 1️⃣ Tasks that don’t require mental input from multiple people, but you always need to ask (or are always asked) for it anyways. 2️⃣ Taking on tasks of others because you’re “better at it” or "faster at it" even though they are skills that everyone has the capacity to handle. 3️⃣ Reminders and checking in because there’s a lack of trust or sense of ownership that the work will get done without the check. In every team, there are managers and there are makers. They have different roles, so it’s natural for their task loads to also differ. For example, a manager should take on more of the “team management” operations like ensuring project work is completed on deadline and clearing up roadblocks that can slow makers down. Keeping your team updated on your work at a regular cadence. Keeping your owned items in project management tools or tracking up-to-date. Knowing what budget or materials you need for your work to get done, and being responsible for getting those requests fulfilled. Team culture activities like birthdays and holidays. The pattern here is taking initiative to be a contributing member of the team. Your manager shouldn’t have to remind you every Friday morning to submit your project updates. Nor should you be expected to always phone in the lunch orders because you sit closest to the delivery door. 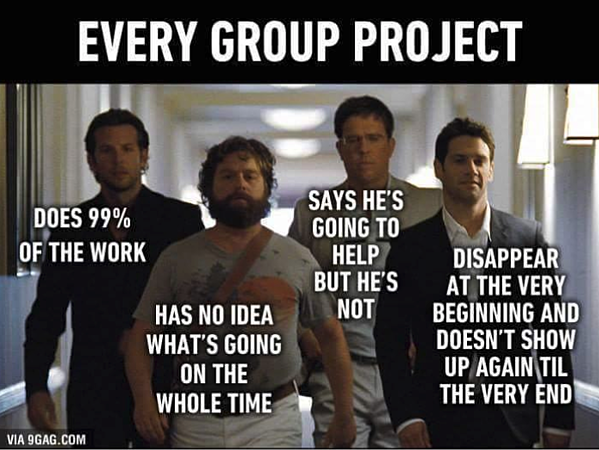 In other words, the words “group project” shouldn’t immediately send you running for vacation. The more you take on invisible work “because you feel pressure to be caring,” the more your motivation will fall somewhere between wanting to and feeling like you have to. Not only does this struggle affect your current stress levels but it sets you up for decreasing job satisfaction and performance over time. Work on your team’s social norms to build group awareness and group management habits into your team work. Help each other highlight moments where “remembering” work is repeatedly done by one or few people on the team. You might want to offer an anonymous team workload survey to create a safe space to break out these tasks. Set up a rotating schedule for recurring team management tasks like company updates, events planning, and meeting setup. And, like at Trello, don’t do nothing. Avoid social loafing on your team by empowering each other to take initiative and find solutions to problems when they arise, regardless of rank or role. Neither are all those little tasks at work that keep a team running smoothly—especially if they’re left invisible and unequally distributed. When team management is everyone’s role, it can help each member grow professionally and build solid relationships that will pay off in spades for both your current to-do list and your future success at work. Take some time to confront that elephant in the room and lift the invisible work weight off of your and your team’s shoulders.